I have wondered. How may I respond in variation to Jean’s grand accumulation, shown just below, of a year’s recording on one section of the Yakima River Canyon? This leaf, lovely in color and form, I found near the intersection of 44th Street and Eastern Avenue on Dec. 13, 2008. 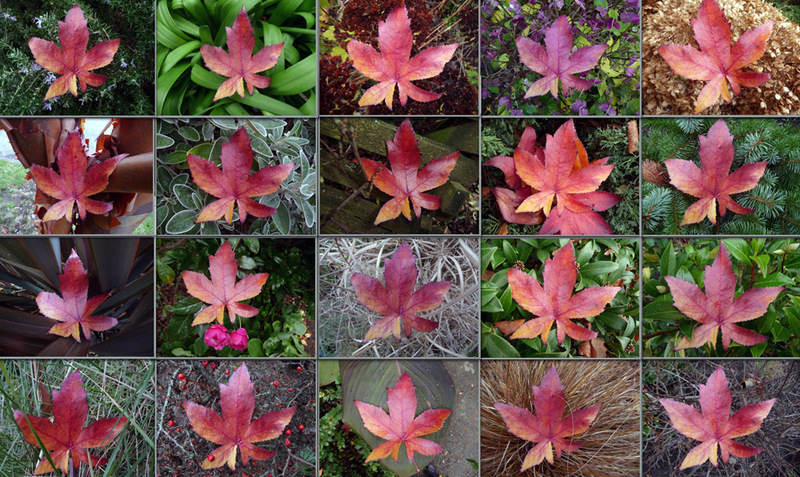 With little thought, I photographed it centered on twenty settings found between where I lifted the leaf from the gutter and where I live. The naturalists among you – and there are several in Jean’s family – may be able to identify many of these settings by type(s). You may also determine a fondness for one setting over the others, but why would you?